Reminiscing on the days when Mama & Papa gardened. Their humble abode was surrounded by fruit trees, flowers, herbs, a vegetable garden and a variety of miscellaneous crops. We lived in a garden sanctuary surrounded by plants and other living things. It was a very functional ecology. They were the best gardeners/farmers, I have had the opportunity to meet. Their gardening was a means of survival for us as a family and they put their hearts in it. The art of gardening was handed down to us, their children, and likewise, I have fashioned the things I grow based on the knowledge they had imparted to me. Mama and Papa had lived a good life and got sick in their old age. Mama had terminal cancer and we knew that it was only a matter of time that the sad news would hit us that she took her last breath. She had been sick and the doctors had given her only 3-4 months to live. She proved them wrong and did a year. The last year of her life she was much stronger than we all were. She knew the day was coming soon and looked forward to going. She would talk about how we should live while she was gone because she wouldn’t be here much longer to talk and encourage us. It seemed like it was only a few days ago that Mama was digging and planting every inch of garden space she could find with rose bushes, other perennials, and annuals. The butterflies, bees, and hummingbird loved her garden and she loved to nurture and tend to her plants. The hibiscus bush in the fence was always an attraction for, this spectacular and extremely rare hummingbird, the scissortail hummingbird. The zinnias, marigolds, and other annuals attracted the bees and butterflies. After long days of work Mama still had time to tend to us children. I remembered the gentle touch of Mamas’ hands as she combed through my hair examining my scalp as I would often request her to do. My excuse was that the scalp was itching and she would search to see if I had lice. She would gentle sectioned my hair with the comb and examined it for me. I’m here musing over the days she would sit at her sewing machine and sew up a uniform for school, a dress, pant or shirt for the grandbaby, boxers or pajamas for Papa. You had a torn garment and she would darn it up in a jiffy. I recalled the day’s Mama used to cook turn cornmeal and roast shad, and then fry it up with onions, and sometimes tomatoes from her garden, to make this delicious gravy to eat with the cornmeal. She would fashion the turn cornmeal into a cake shape in a bowl, then slice it to serve on the plate. Wish I could make turn cornmeal as good as mamas’. Most of her cooking was from the food and vegetables grown in their garden. Mama knew how to ‘tun yu han and mek fashin’ as the Jamaican saying would go. Whenever she went into the kitchen to whip up a meal from the crops grown in the garden, the meal on the dinner table would be a delicious treat, no fancy restaurant could dish out. Papa had gone on before her and had suffered from heart problems, dementia, among other ailments. I missed the days after all the daily garden chores were done, of him teasing her when she did what she knew best at the sewing machine. With each outfit she made, he often says she ‘cobbler it up’, but would wear it with pride. His humor was beyond the chain and often had everyone laughing so hard they often cried. Many evenings we would sit and listen to Dulcimina stories on the radio or watch “Knots Landing”, “Dallas” or “Peyton Place”. When electricity was off which was a constant thing in the Islands, we would sit under the moon and stars and talk for hours. Papa would chime in with his plans for the days ahead and then we would talk about the things that were happening around the little Village we called home. When my daddy is planning for the days ahead and he says to keep quiet, you better not mutter anything or else… The kamikaze-style of mosquitoes on one’s skin siphoning blood called for retaliation of hands clapping against the skin in an explosion to get rid of the enemy. A mosquito destroyer coil was often burning not too far away to repel the enemy. The sound of crickets and lighting bugs breaks the silence in the night. As children, we usually catch the lighting bugs and put in jars. This was entertainment for us as they light up the night. I can hear Papas’ voice as he would often sing or whistle while working. His voice would echo across the fields when he was cutting down trees to make room for new crops. Each time he lifted his axe he would resonance out a sound of a line of his song of choice; at the drop of the axe against the wood, he would repeat another line followed by a sound from the ‘Hooh’ ‘aah’ like the sound of the man working on the chain. Sometimes he would grunt as the axe hits the tree trunk, axe and grunt becoming a rhythm to his tune. Sometimes his song would be so drawn out like ‘nine nights (set up songs)’ that took him a few chops to sing a complete line or verse. I’m here smiling as I recall Mamas’ and Papas’ contagious laughter when they would reflect on the ‘good ole days’. Mama didn’t like to talk much about her young days, but Papa recalled each event with much delight. 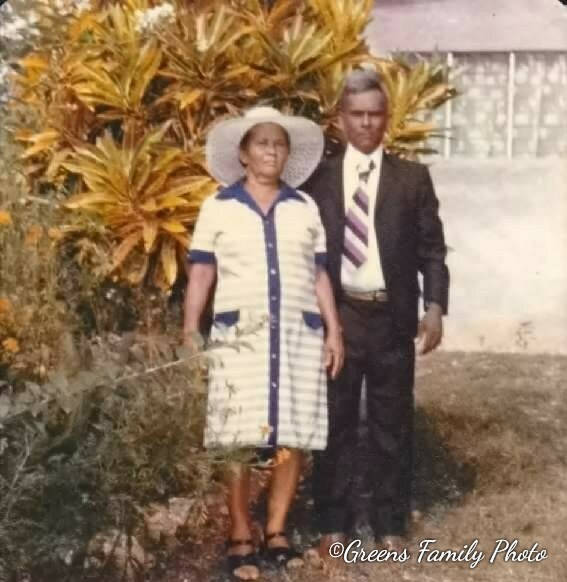 The days when we would have a good laugh when the village news lady, (Papa always call her “Dulcimina News”), would stop by and dish out a handful of village gossip. My daddy had a name for just about everyone in the village. These people had no idea that was their village name and Papa often used the village name when talking about them. Some were Dulcimina, Smelly, Sasha-Mani, Big-drink, etc., to name a few. Mama and Papa were avid gardeners and depended on the farm for survival and sustenance. We would plant crops for our daily eating and sell some locally. Some of the crops we grew were cassava, yam, dashine, banana, mangoes, oranges, lime, gungo peas, a variety of beans, red peas, black eye peas, watermelon, pumpkins, eggplant, tomatoes, to name just a few. Mama would plant beans on every stake around the homestead. Peppermint, basil and a variety of other herbs, aloe-vera, and a cactus plant grew behind the homestead’s kitchen, for when sickness ails us. Mama had a flower garden sanctuary, unlike no other in the village. Her Poinsettia’ red alongside the fence, when laden with double folded red petals, would lean over the front porch. This was a sight to see and often passersby would come to a halt just to admire. The variety of colors from her garden displayed all the colors of the rainbow and some. She was an avid gardener and every plant she touched turned green. She had a variety of rose bushes that other gardeners envied for their garden. She would always in-grafted new plants from her existing plants to share with others, her garden beauty. As you can see in the featured picture is a large croton plant.